This is a charming and delightfully silly little picturebook, aimed - I suspect - at both the tech-savvy toddler and the paperback-loving parent. 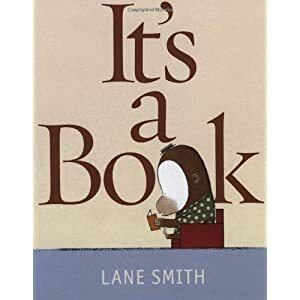 Lane Smith is probably best known in the UK as the illustrator of Jon Scieska's The True Story of the Three Little Pigs and The Stinky Cheese Man and Other Fairly Stupid Tales, and he brings the same wonderful simplicity and energy to the illustrations here. Jackass's puzzlement and Monkey's growing exasperation are beautifuly conveyed. The same simplicity and energy is evident in the text; little ones will thoroughly enjoy joining in with the repeated refrain of "It's a book! ", and will revel in their instant grasp of the concept that Jackass just doesn't get. The more ICT-literate readers will love the section in which Jackass attempts to simplify a page of story into a twitterish handful of characters. It's important to note that this is not an anti-tech book; it doesn't attempt to suggest that Jackass's laptop has no value. The message is that even in a world of internet and smartphones, the book still has its place and still retains its own special and irreplaceable magic. And with that said, just to prove I'm no technophobe, I'll finish by embedding the official book trailer*. *I prefer the book, myself. And I think you will, too. Always great when books like this - and with messages like this - are applauded! Didn't know or recognise that Lane Smith had illustrated "The Stinky Cheese Man". Such a different style - and emotional style too. Great to see this post - and the video. Bother and blow! It must have been a very busy school visit week. I just found myself thinking "and it would make a good class assembly too!" Must have slipped my teacher head on again for a moment there.